Bad behavior can kill your Pinterest perfect lesson in no time. I know we all have spent countless hours lesson planning only to have your lesson ruined by one little one who will remain nameless! Before you do something CRAZY, read on! I can help! If you have an RTI (Response to Intervention) team, this would be a great place to start. If you are going at this solo, I highly recommend you reach out to a colleague that you admire the way he/she manages behavior and get some input. Brainstorm the top 5 behaviors you wish he/she would change or do differently. Then determine if you want the behavior goal be meet daily (more severe) or weekly (less severe). Sit down with the child and discuss the target behaviors you came up with. Then determine what motivates this child. Is spending time with you or another special person? Is it listening to their iPod during independent work? What makes this person tick? There are several surveys you can give to help with determining motivation if you are stuck. This motivation is what will help you and the student choose a reward when they meet the goal. Here are some great resources for a reward system. Another thing that I found to be very motivating was having students get to choose a friend that would also get to do the reward with them. That way other students in the class could help motivate this child instead of being annoyed by them. 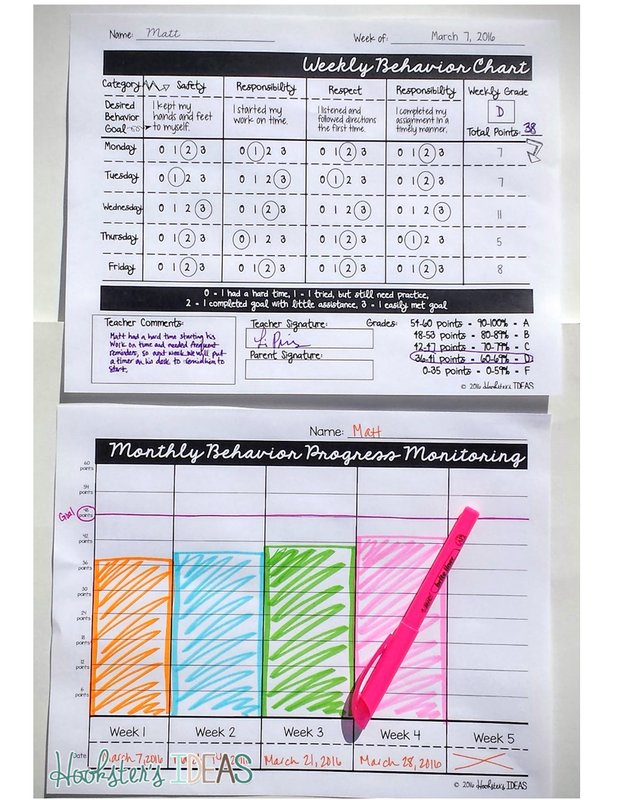 Once you have your reward in place and your behaviors identified and discussed with student (and parent), you are ready to start using the behavior charts. The key with anything that creates change, is consistency. It is critical that you and any teacher the student goes to follows through with the plan. This means that you need to mark this child's chart after every block of time outlined on the chart (this varies by what the child can do and still be successful...some students can be successful after 2o minutes, others it is more or less time). It is A LOT of work for the teacher initially, but it becomes more automatic the longer you use these charts. At one point, I had three students on different behavior charts that required check-in every 20 minutes. Yikes! I made my students responsible for asking me to sign their chart because I would forget. I told them, that they needed the points and it was their responsibility to ask me and I gave them a non-verbal signal (writing with an imaginary pen in the air) to cue me to come over and mark their chart. I also initial my mark so that I know which ones I marked and which ones they marked (see below). 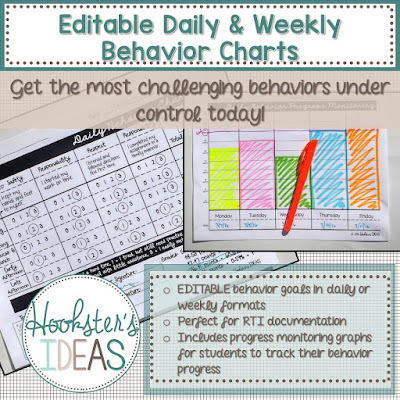 At the end of the day or week (depending on the chart format you are using), I would have the student tally the points and determine their score for the day/week. I usually didn't have time at the end of the day to do this, so I would have students tally and check-out with me on the way to the bus or dismissal. If they earned their goal, they would get their reward first thing in the morning. I made it so they didn't even have to ask me. They would just do what ever their pre-determined reward was (usually with a friend). How do you handle disruptive behaviors in your class?